Minneapolis Woman Killed By Police Officer After Call Of Possible Assault The two officers reportedly did not have their body cameras turned on, nor did the squad camera record the fatal shooting. 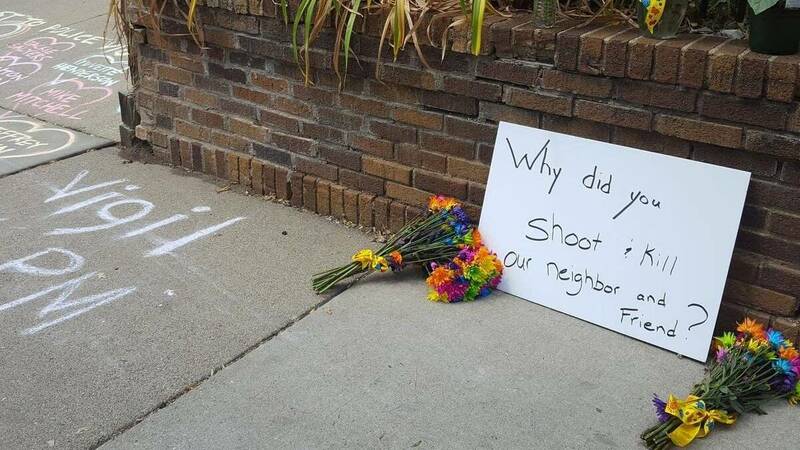 A sign in south Minneapolis, where a woman was killed Saturday night by a police officer, reads "Why did you shoot and kill our neighbor and friend?" A woman died after being shot by a Minneapolis police officer late Saturday night, according to the state's Bureau of Criminal Apprehension. Her identity has not been released by authorities, but her fiancé Don Damond identified her to MPR as Justine Ruszczyk, an Australian woman who taught yoga and meditation. Around 11:30 p.m. CT Saturday, two Minneapolis police officers responded to a 911 call of a possible assault in south Minneapolis. One officer shot and killed the woman. According to the bureau, the two officers did not have their body cameras turned on, nor did the squad camera record the fatal shooting. Late Sunday afternoon, Minneapolis mayor Betsy Hodges and Assistant Police Chief Medaria Arradondo said they had few other details to share. Arradondo said following the 911 call, officers were dispatched on an "unknown trouble" call. He said officers arrived at the address and when it became a shooting he alerted the BCA, which now leads the investigation. The Hennepin county Medical Examiner's Office is conducting an autopsy. Both Hodges and Arradondo said they are not releasing the victim's name and said that information will later come from the BCA. But at a gathering Saturday night, friends and neighbors said the victim taught yoga and meditation in the community. At a healing circle in front of the crime scene, those neighbors and close friends, as well as Black Lives Matter activists and members of Womens March Minnesota, held hands, and talked about the deceased woman, naming her simply as "Justine." "Peace flowed through her," said neighbor Melinda Barry. "She was a lovely, lovely person. And we want to remember Justine tonight, and call for answers, but we want just to remember and respect Justine, tonight, and her family, and share our love for her family, and how much we want to wrap our support around them." Nancy Coune and Cindi Claypatch said they knew her well from their involvement at the Lake Harriet Spiritual Community Center in South Minneapolis. "If you could just see her, she was adorable with this incredible smile," said Coune. "You know, it's like when you're in the presence of a room with somebody who's in a nice feeling, you rise whether they open their mouth or not ... she was really shiny, she was very bright," added Claypatch. Eduardo Drake is also part of the Lake Harriet Spiritual Community Center. He brought flowers and wrote a message in chalk for his friend. "Justine was all about love, just bringing your biggest heart forward, no matter what you're doing in life," said Drake. "Her loss, for me, is just a personal reminder that we shouldn't waste time on petty gripes or complaints, we should just find a way to love, bigger and better, because we don't know when the people we care about may not be there anymore." Friends and community members say they want to know the names of the two officers involved in the shooting, and also want transparency as the investigation continues. Mayor Betsy Hodges said it's "difficult and challenging" to have few facts at this point. She called the southwest Minneapolis neighborhood where the shooting happened "tightknit." She represented the area when she served on the city council. Earlier Sunday in a statement Hodges said, "my understanding, from the BCA's initial statement, is that the officers' body cameras were not turned on at the time of the incident and the squad camera did not capture the incident. I intend to learn more."